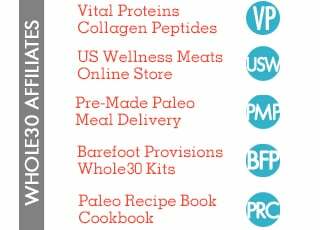 by Whole30 team member Shanna Keller, who in her pre-Whole30 life swore up and down she could never, ever give up half-and-half. Want to win some nutpods?  Scroll to the bottom for details on our giveaway. Here’s one of my intentional habits that started during a Whole30 and persists to this day: I wake up every morning at 6:30 am, so that I have enough time to brew a high-quality cup of coffee and make a nourishing Whole30 breakfast. Then I sit quietly, preferably outside or in a sunny spot, and enjoy them both in the peace and quiet of the morning. This is one of the ways the ways that I incorporate the lessons I learned during a Whole30 into my life after. A healthy breakfast and a peaceful mind allow me to thoughtfully approach the rest of my day. 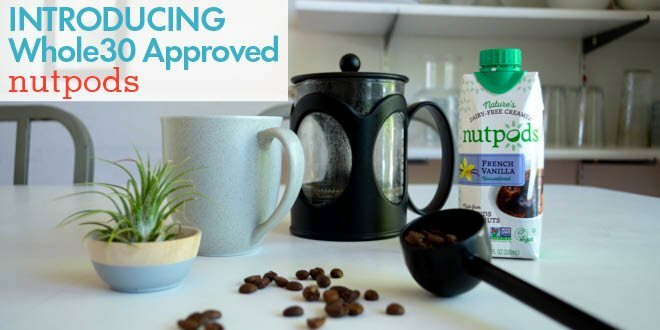 The first time I tried nutpods dairy-free, unsweetened creamers, I knew they were the perfect special addition to my quiet morning routine. 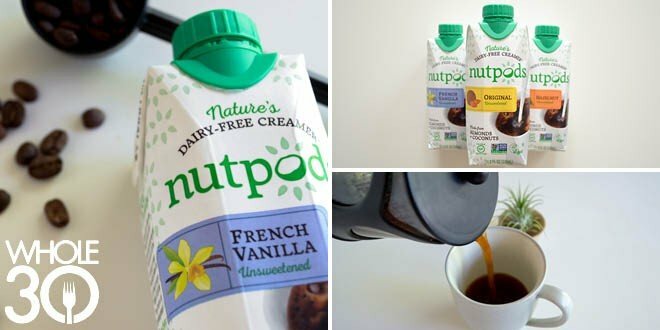 I don’t use nutpods creamer every day, but it is my go-to for an easy, delicious way to dress up my coffee on a morning where I something fun. Sometimes I go a little wild and add a bit of cinnamon, raw cacao or cloves to my coffee grounds. Those additions, plus the three nutpods flavors—Original, Hazelnut and Vanilla— create a bunch of fun possibilities for flavor combinations. All three of their flavors are available via Amazon, or directly from their website. And now, onto my tried-and-tested fun coffee recipes, plus a tea drink for you non-coffee drinkers. GRIND the coffee beans for French press brewing (coarse enough to be filtered by the press but fine enough for extraction). Combine the ground beans and cold water in a French press (if you’re using cinnamon, add it to the beans and water) and stir gently to combine. STORE the un-plunged French press in the refrigerator overnight. IN the morning, plunge the French press to filter the coffee. Pour coffee into a glass filled with ice. Add desired amount of nutpods creamer. Enjoy while eating your favorite Whole30 Breakfast. IN a French Press, combine your desired amount of coffee, raw cacao and water per the formula above. For one person, 4 Tbs of ground coffee, 2 Tsp of raw cacao and 12oz of boiling water is enough for one standard size cup of coffee. SET a timer for four minutes. After one minute has passed, gently stir the mixture with a wooden skewer, chop stick or wooden spoon. IN the meantime, pour remaining boiling water into your ceramic mug. Once mug is warmed, discard the water and add desired amount of nutpods Vanilla creamer to the mug. WHEN four minutes has passed, gently plunge the French Press to filter the coffee. If you meet resistance, simply pull the plunger back to the top and plunge again, taking care not to plunge too forcefully. This technique will help you to avoid bitter coffee. POUR the coffee into the mug and stir to combine coffee and creamer. Find a quiet nook to relax in, and sip while you wake up slow. 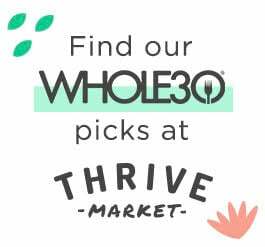 Note: There are Whole30 compliant Chai tea blends widely available, but some brands do use stevia or other sweeteners. Be certain to read your labels. We like the Republic of Tea Chai Black Tea Bags, but they do have caffeine. If you don’t do caffeine (like Melissa Hartwig), try their Red Chai, naturally decaffeinated. CUT open desired amount of tea bags, and empty them into a French Press. Add the ginger, anise seed pod, cloves, peppercorns and cinnamon stick. Slowly pour desired amount of just-boiled water over the tea. Gently stir the beverage to combine. SET a timer for 5 minutes. In the meantime, warm a ceramic mug with extra boiling water. 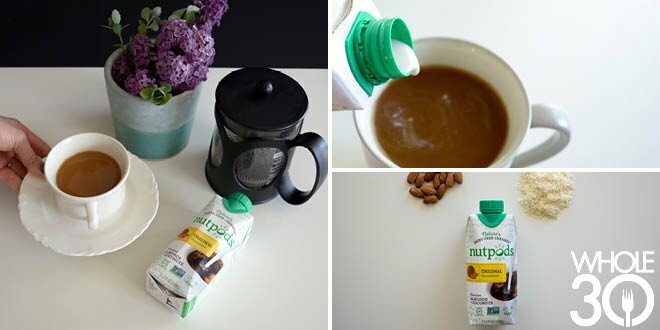 When mug is warm, discard the water and add your desired amount of nutpods Hazelnut creamer. WHEN five minutes have passed, plunge the French Press. Pour the tea into the mug and stir with a wooden stick to combine the tea and the creamer. Snuggle up with your favorite novel, and savor. We’re celebrating our Whole30 Approved partnership with nutpods with a social media giveaway. Head over to our Instagram page to find out how to win.